Sounds pretty interesting. Could another taper be used instead of the W1m pot? 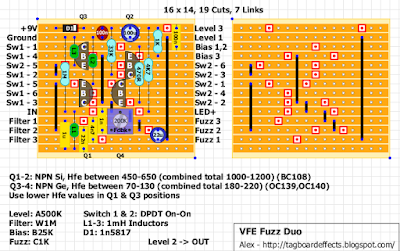 I also noticed that you labeled the transistors backwards in the layout notes. Not to nitpick or anything. I may have to give this a shot. If you check some of the other VFE layouts comments, Peter Rutter (from VFE) has suggested how to substitute W pots. The problem is that they were custom made. This one reminds me to my plum crazy efx "polecat fuzz". 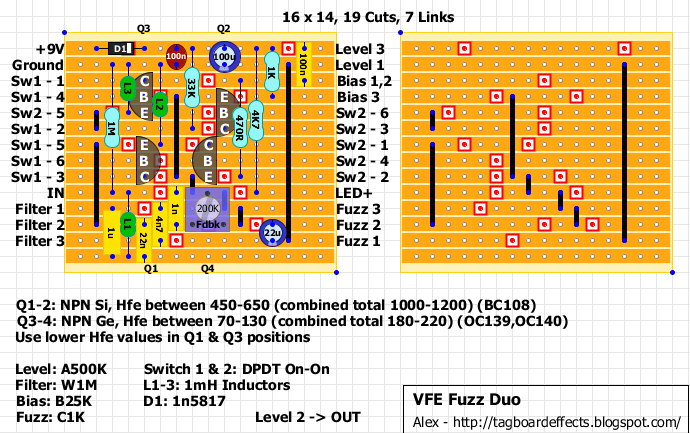 It was basically a "fuzzy lady", (kind of a fuzzface clone), with a switch that combined ge-ge/si-ge transistors. Verified! This is a really nice fuzz with some nice fuzz options. Used Bc108s with hfe ~550 and OC139s with both hfes at 105. Thanks Alex & VFE for the schemo. This is gorgeous -- it may be exactly the fuzz I've always wanted. I used AC176Ks for the Ge transistors; got them from this eBay seller, who I highly recommend: http://www.ebay.co.uk/usr/aberdeencd?_trksid=p2057872.m2749.l2754. If anyone's struggling with the switch numbering as I did, this is the scheme to use: http://media.stinkfoot.se/2010/11/DPDT.gif. The web address above cannot be found helveticat - can you help out? Well, this is a later reply... Alan, I hope you found a source... For anyone else who comes by, the chap I used was called John Harper and you can find his eBay by searching his name + transistors on Google. The input and filter sections look off. Looking at the schem. on the FB page and the Eagle files, the signal first goes through the inductor and then splits off into the 22n and 1uf. The 1uf also only goes to #1 of the filter pot, not #1 and #3. I still used the layout with 2 little hacks. Having the inductor hanging off board on the input, and moving the 1uf up so it connects from IN to filter #1 (at an angle). Filter #3 should only go to the 4n7. I have a W1MC pot, and it now works as advertised: "Setting the FILTER knob fully counterclockwise lets the full bass range through the input stage. As you turn clockwise to 12:00, the FILTER knob cuts bass and tightens up the low end. From 12:00 to fully clockwise, this knob begins to cut the treble response in the gain, smoothing out the top end"
I also tested it with a B100k, as that's been suggested as a substitute elsewhere, but it didn't work as well as a B1M. 01/07/2018 Layout verified, thank you! The W1M is replaced with an A1M and the inductor coming off Q3 is replaced with a jumper. There's also a 100pf, but I don't know what its connected to. It was removed for the updated revision. Its funny i verified this with the previous layout and it sounded really good. I'll go back to this and see what difference the changes make.